Teach your kids the value of change and how to count it in several different ways with Learning Resource's Money Bags Board Game! 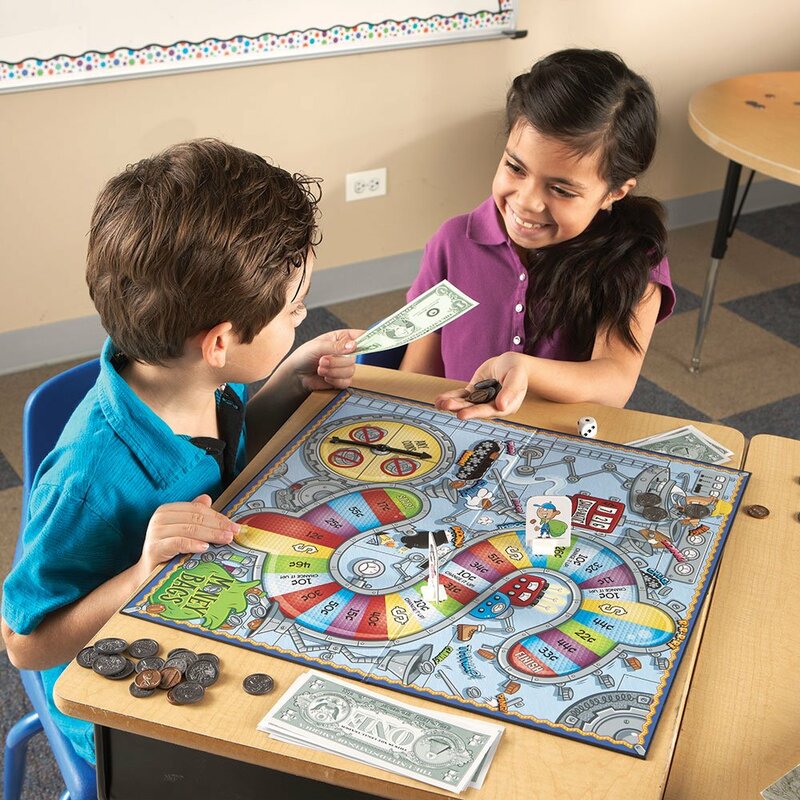 This board game with realistic-looking coins helps children learn the value of money and how to count change in different ways. It comes with coins of different values including pennies, nickels, dimes, and quarters, and a spinner to play the game. Help your child enhance their math skills through this board game by Learning Resources that helps children learn the value of money. To play, the child will spin and then move the number of places on the game board. The amount of change they count out depends on where they land on the board. The child can then, optionally, spin the spinner, and that will tell them what coins they are not allowed to use when counting their change. Then, they begin to count their change and do so until they are finished. When a child hears the word “learning game”, they think boring. However, boring is the total opposite of the Money Bags Coin Value educational board game by Learning Resources. Users say it can be played quickly, good for children with short attention spans. The entire game can be played within ten to fifteen minutes. Some users have used it for math support with their kids, helping children who don’t understand the concept of money, and some just play it for fun. There is an optional spinner in the game that can be used to eliminate a coin. For example, if the spinner landed on quarters, and the child had to count out thirty cents, they would have to count the amount without any quarters. This helps children learn to feel confident with all of the different coins and be able to make change in different ways. The realistic pieces help kids to learn the values, and since they look similar to real change, when it comes time to deal with real money, the child can recognize the coins. One complaint that was mentioned that a game was missing pieces when it was delivered. There have only been a few reports of missing pieces, but to prevent losing the coins, it is recommended to keep them in a small plastic baggie when the game is not being played. Also, one user complained about ordering the game online and receiving the Canadian currency version of the game. To prevent an error like this from happening, check through your purchase before finalizing your purchase of the game. The set comes with a cardboard playing board, plastic coins, and a cardboard spinner. Several pieces included in this game are small and not suitable for children under the age of four. Valuable money skills are "in the bag" as students collect, count and exchange money all the way to the finish line. 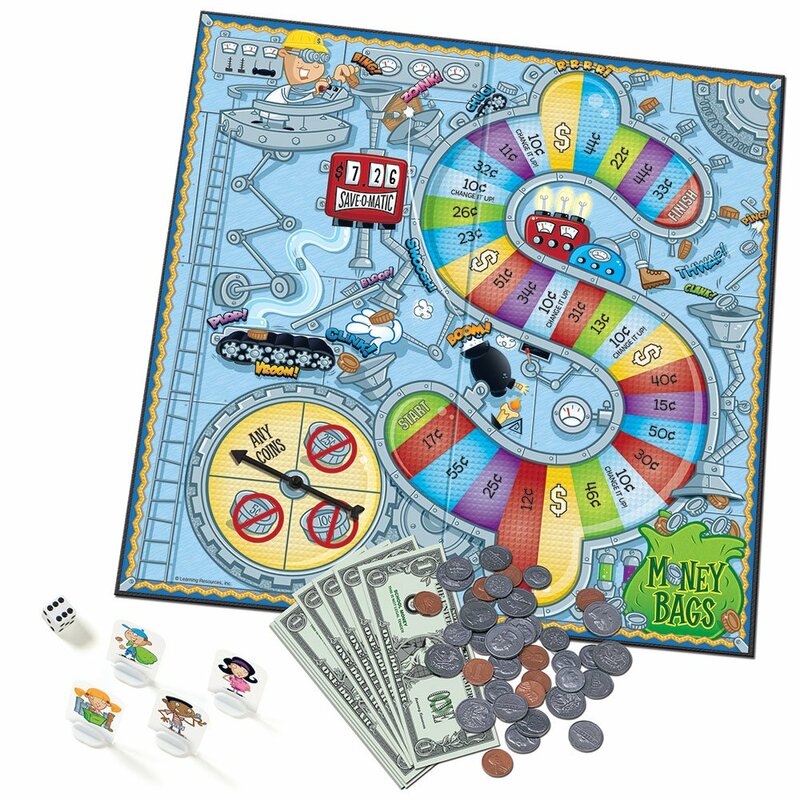 Includes game board with spinner, 100 plastic coins, play bills, markers and die. For 2–4 players. Game board measures 12"L x 17"H. Grades 2+.